A bar is associated with refreshment where you have some pegs or some other beverages along with some light snacks. When we talk about a bar a long wide wooden table comes in our mind. We usually drive all the way long to go out there in a bar to enjoy some pegs or some other drinks to refresh ourselves. So it is more of a entertainment place for us. We have worked on various wooden pallet projects where we have upcycled many furniture items that are being used practically in our daily lives. Today we have plans to make an outdoor bar out of wooden pallets. 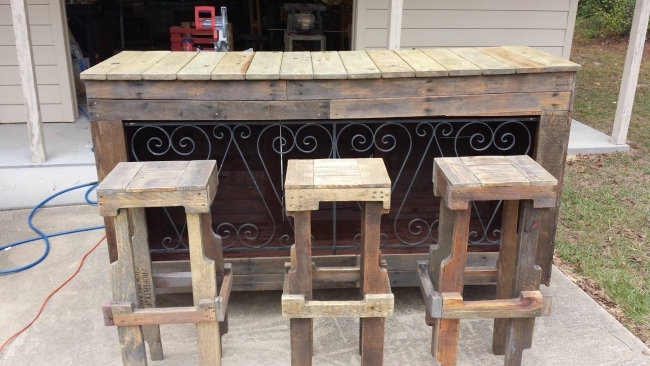 If you have a bunch of old pallets lying in your backyard, and also have the basic know how of the wood work then trust me this pallet project of an outdoor bar is going to be pretty handy and entertaining for you. Now having a detailed look of the wooden pallet outdoor bar, we can easily find out that the entire outdoor bar is made using the wooden pallet. Though we can also see a metallic designer grill inside there which is an additional feature to make it look much better. Somehow the rest of the structure is made using old pallets. The straight raw pallet planks are cut to size after dis assembling from the pallets. Plus we can also a trio of sitting stools that are pretty high in their appearance. As they are meant to be placed in front of this outdoor pallet wooden bar so their height is pretty in accordance to the size of pallet bar. This is a beautiful set of pallet wood bar and stools for your outdoor space rather it be your patio or lawn. 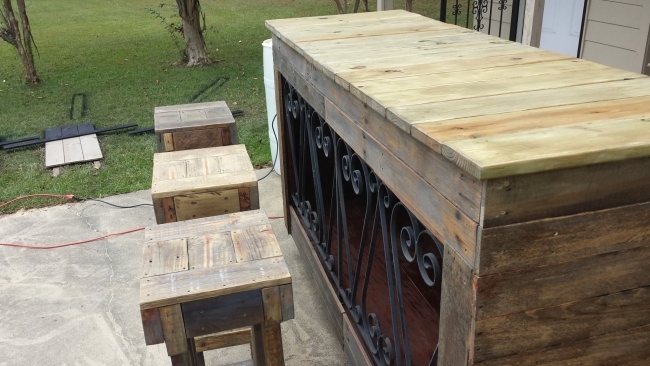 Enjoy a family reunion or a peg with your buddies sitting around this marvelous outdoor bar.